“My training at Tougaloo and experience as president of the MS State Conference NAACP has prepared me for this opportunity. I’m thankful to the Board of Directors for investing trust in me to head the association during this time. 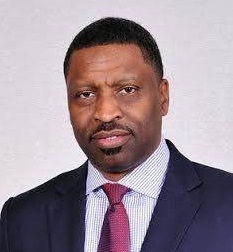 It is significant because I want to make sure that we are equipped to take on the challenges that the current political landscape presents,” says Tougaloo Class of ’93 alum, Derrick Johnson, who has recently been named the President and CEO of the National NAACP. Derrick Johnson formerly served as Vice Chairman of the NAACP National Board of Directors as well as State President for the Mississippi State Conference NAACP. A longstanding member and leader of the NAACP, Mr. Johnson is no stranger to the interworkings of this prestigious civil rights institution and the importance of community activism and engagement. In addition to his work as State President for the Mississippi State Conference NAACP, Mr. Johnson founded One Voice Inc., in the wake of Hurricane Katrina, to improve the quality of life for African Americans through civic engagement training and initiatives. “I’m very excited for his new role as national president. I think it’s going to mean wonderful things for the nation and for us here in MS. Derrick has always been committed to the NAACP. And he’s the right person to bring it back on track,” says Ms. Lambright. After graduating from Tougaloo, Johnson continued onto Houston, TX to receive his JD from the South Texas College of Law. In later years, Mr. Johnson furthered his training through fellowships with the Congressional Black Caucus Foundation, the George Washington University School of Political Management, and the Massachusetts Institute of Technology (MIT). He has served as an annual guest lecturer at Harvard Law School, lending his expertise to Professor Lani Guinier’s course on social movements. Johnson also serves as adjunct professor at Tougaloo, which shows the rich legacy of alumni involvement that those who enter Tougaloo’s gates continue to fulfill. “Derrick is a difference maker and we are confident his reign will impact positive change in our nation. We prepare our graduates to be productive in their time and lead the change for a more just, humane and inclusive world. We are immensely proud of Derrick Johnson and extend our full support,” adds Hogan. Mr. Johnson is a veteran activist who has dedicated his career to defending the rights and improving the lives of Mississippians. As State President of the NAACP Mississippi State Conference, he led critical campaigns for voting rights and equitable education. He successfully managed two bond referendum campaigns in Jackson, MS that brought $150 million in school building improvements and $65 million towards the construction of a new convention center, respectively. NAACP President Derrick Johnson, Tougaloo salutes you!